Showers/flurries possible early today across PEI..
Monday, October 22nd 6:40am… Onshore cloud and showers/flurries expected for the first part of today with clearing expected this afternoon as high pressure builds in and winds shift to the SW-W. Clouds redevelop near dawn tomorrow and rain by the late evening as the next weather system approaches. This system is an area of low pressure approaching/redeveloping near Cape Cod tomorrow evening. This intensifying storm is expected to track NE along the coast of Maine by Wednesday morning then turn northward tracking through NB to be located in northern NB/Gaspe Bay area by Wednesday night. Areas west of the storm track (northern western NB ) may see their first snow event of the season while Southeastern NB, PEI and NS will see significant and rain from this system. Cooler air will then flood in behind this system as it pulls away ti the north on Thursday and Friday with onshore cloud, showers or flurries a good possibility. Sunshine and very light winds expected on Saturday as high pressure crests over the region. Sunday is now looking very interesting… A subtropical low pressure system is expected to track northeastward out of the Gulf of Mexico on Friday to be located near Cape Hatteras Saturday afternoon. 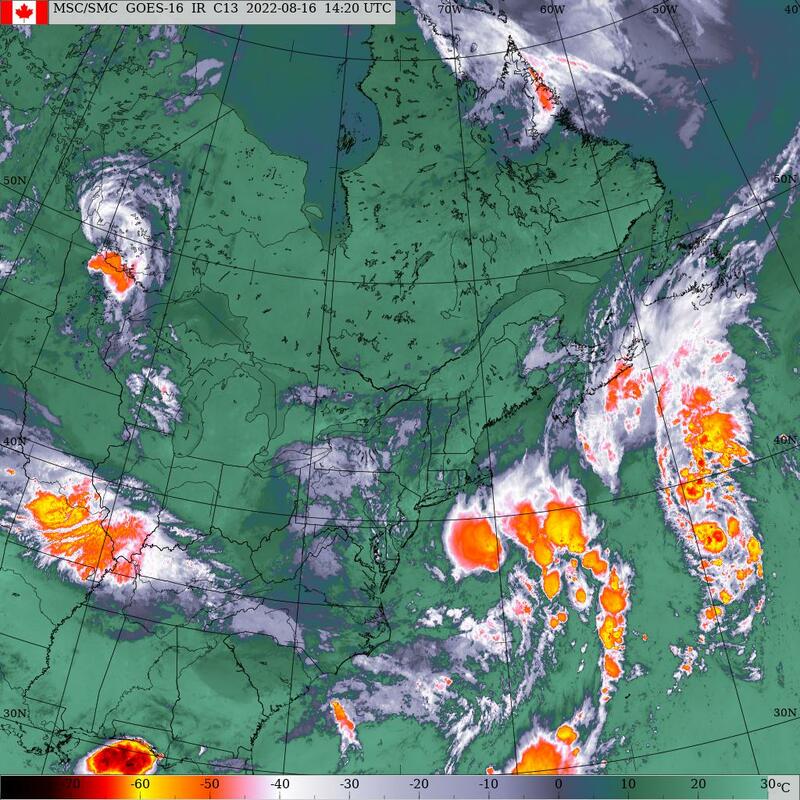 This intensifying storm is then expected to continue tracking NE to towards the Maritimes for Sunday and Monday. At this time, the all so important track in still unclear. Will it stay off shore or track up through the Bay of Fundy. This has the makings to be a significant fall storm with rain and wind for the end of the week. Stay tuned..
Precipitation.. Showers or flurries, expected this morning but should taper off through the afternoon. Dry tomorrow. Rain develops late Tuesday then tapers to showers Wednesday morning giving about 5 mms then change over to flurries for Thursday and Friday. Saturday will be dry followed by a possible significant rain event for Sunday afternoon into Monday. Temperatures.. Cool today, normal tomorrow, above normal on Wednesday followed by below normal for Thursday through Sunday. Wind.. Light-brisk W-NW winds this morning will slowly back to SW-W tonight into tomorrow then diminish to calm by Tuesday afternoon/evening. Increasing SE winds Tuesday evening sifting to SW Wednesday afternoon. Brisk west winds on Thursday and Friday diminishing to calm on Saturday. Increasing easterlies on Sunday as that ocean storm approaches. Hazards.. Fairly quiet today. Wet driving conditions in rain developing tomorrow evening. For anyone planning to drive across NB into Quebec Tuesday night better keep an eye on the forecast. Possible winter driving conditions expected west of Fredericton into Edmunston and eastern Quebec late Tuesday.